RampNOW sells and rents many types of ramps in Illinois. We are the ramp professionals. 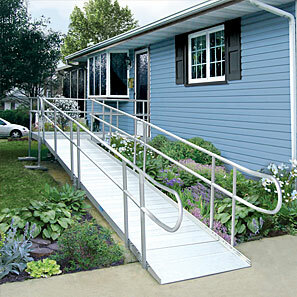 We rent and sell ramps that help people get in and out of their homes. A wheelchair ramp is usually installed in addition to or instead of stairs. Ramps permit wheelchair users, as well as people using walkers and power chairs easily access a building. Ramps must be carefully designed in order to be useful. Many jurisdictionshave established minimum widths and maximum slopes. A less steep rise can be easier for a wheelchair user to navigate, as well as safer in icy climates. A wheelchair ramp can be permanent, modular or portable. Permanent ramps are usually constructed from wood with concrete footings. Wooden ramps need to be painted on a regular basis. As wooden ramps tend to be slippery, you usually want to make a wooden ramp about 30% longer than a similar metal ramp that has a built in non-slip surface. Modular ramps are more durable than wooden ramps and can be moved or reconfigured. Modular ramps rest on top of the ground. They are exempt from building permits in most localities. Modular ramps are usually constructed of aluminum, which does not rust. Steel is occasionally used for modular ramps but steel ramps tend to look bad after a few months. These ramps are ideal for both long and short term use. There are many uses for our Portable Ramps. Lets us show you! Many commercial and institutions need ramps. We are the experts. The low profile aluminum Threshold Ramps are ideal for use in doorways and thresholds. There are many more types of ramps we sell. Please call or contact us for more details. Sorry for the delay getting back to you. Getting my mother settled into her house in a safe and enjoyable way has become a big task. That is why working with you and your company has been blessing during this stressful and time consuming period. To start with, you and your staff have addressed my needs both personally and professionally to have a quick and trouble free installation of your stair chair lift system. My 92 year old mother was coming back from a rehabilitation center after breaking her hip. The rehab center gave us 3 days notice she was being discharged which caused preparations to be accelerated. Your staff and installers installed a stair lift system in 2 days to match my mothers return. Your installers were profession, courteous and efficient with the installation and stayed late to help demonstrate and answer questions. All this was on a Saturday! Finally, you product is first rate and user friendly. It was simple to operate and made for safe passage up and down the stairs for my mother and was easy to use with her live-in care giver. Since the hip replacement, my mother is unable to use stairs, but your product opened up my mothers world to both levels of her house. She was stubborn at first to use the lift, but after several days she asked if it could go "Faster"! Thanks again for making my mothers quality of life better. Bob T.